Dorothee Soelle once wrote, “Dietrich Bonhoeffer is the one German theologian who will lead us into the third millennium.” As we near the end of the first decade of this third millennium, Bonhoeffer continues to inspire new generations as a spiritual guide for their actions on behalf of peace and social justice. This book by Geffrey Kelly provides a critical analysis and reading guide to two of the spiritual classics that are now available in new translations through Fortress Press. Reading Bonhoeffer offers a running commentary of each segment of these popular texts along with discussion questions suitable for the university and seminary classroom as well as parish adult education programs. In a final section of the book, Kelly excerpts and analyzes three significant texts by Bonhoeffer on the need for world peace against the rising militarism and continued glorification of war in Germany and other European nations. This volume is a deeply informed treatment of Dietrich Bonhoeffer’s life and writings, mined so as to illumine his spirituality and moral leadership and the vital connections between them. After an engaging forward by Renate Bethge, Bonhoeffer’s niece, and a preface about the book’s focus and its place in the array of Bonhoeffer studies, a compact biographical chapter is offered (“The Life and Martyrdom of Dietrich Bonhoeffer”). Then follow nine chapters that draw widely from Bonhoeffer’s actions in the Nazi era and from his writings, both well known and little known. Since the twelve years of “The Thousand Year Reich” and his own mature years coincide (he was hanged in 1945 at the age of thirty-nine), Bonhoeffer’s words and deeds are tightly interwoven with the drama of Germany and the world during this period. Each of the book’s nine chapters is topical, ordered around a key theme in Bonhoeffer’s spirituality and moral leadership. Chapter titles and subheadings guide the reader: “Compassion and Action for Justice: Bonhoeffer’s Christocentric Spirituality”; “The Holy Spirit and Christian Discipleship: The Prophetic Dimension of Moral Leadership”; “Bonhoeffer’s Spirituality of Liberation: Solidarity with the Oppressed”; “The Spirituality That Dares Peace: The Great Venture in Moral Leadership”; “Discipleship and the Cross: Following Christ in Bonhoeffer’s Spirituality”; “Christian Community: Strength for Moral Leadership”; “Bonhoeffer’s Spirituality and God’s Vulnerability: Compassion for Those in Suffering and Sorrow”; “Preaching the Spiritual Life: Bonhoeffer’s Sermons and Insights on Moral Leadership”; “Glimpses into the Soul of a Moral Leader: Bonhoeffer’s Prayers and Poems.” Discussion questions are provided in an appended section for those who wish to use this to study together. The audience itself is the college-level reader in a variety of settings: the classroom, the church study group, the individual drawn to Bonhoeffer’s witness and wisdom. Endnotes, bibliography, and an index of names and subjects facilitate scholarly use and quick reference. The authors, well-known in Bonhoeffer studies, are in full command of their materials. The prose is clear and smooth, despite the complicated story and a full well of sources. The result works on two levels. It is a very fine introduction to Bonhoeffer’s life and thought for the novice or near-novice. It is also an integration of sources and resources that deepens and extends the knowledge of those already familiar with Bonhoeffer’s major works. It can thus stand on its own as a good read, just as it can serve as a key text in a course that includes close study of Bonhoeffer’s writings. The chief criticism will come from those who ask the book to do more than it promises. It promises to show the vital interplay of Bonhoeffer’s piety and his costly moral leadership. That it has done, convincingly, even movingly. It doesn’t, however, give us what we, as readers, would now have: a theory of moral leadership, its sources and development, as exemplified in this compelling figure. That awaits a further, yet unwritten, chapter. Oh, no, not another Bible! There are myriad manifestations on the market already, including cause-oriented editions like the Green Bible and The Poverty and Justice Bible, Bibles that aim at affinity groups like The Golfer’s Bible and The Orthodox Study Bible, and “author-ized” versions named after MacArthur, Blackaby, Stanley, Ryrie, and Maxwell. There are also several general-audience, translation-based study Bibles that have found a prominent place on bookshelves and desks, including the best-selling NIV Study Bible and the Life Application Study Bible. Is there room on the shelf for another? The ESV Study Bible makes its debut in a market glutted with niche Bibles, but has a long list of enthusiastic endorsements, so it is worth a look. The ESV Study Bible’s text, of course, is the English Standard Version translation. Published in 2001 by Crossway, “the ESV is the fasting-growing Bible in publication today, with worldwide unit sales having quadrupled over the past three years. A distinguished team of more than 100 Bible scholars and teachers worked for nearly four years to create the ESV Bible. Based on precise comparison with the original language texts and manuscripts, the ESV is a ‘word-for-word’ Bible translation that skillfully combines accuracy and literary beauty” (ESV-SB Blog). Now the popular ESV text is accompanied by an impressive array of features that will help any Bible student more fully enjoy and engage the text. An informative and attractive website lists some of the ESV-SB’s primary features. I’ll list the features, and then comment on my reaction to each of these as I’ve looked through my own copy. The ESV-SB weighs in at over four pounds, but that’s no surprise considering the list of heavyweights the editors have assembled as contributing scholars. I would describe the excellent notes as clear, concise, and theologically conservative. The layout of the notes is aesthetically pleasing, with color highlights to help offset comments according to their corresponding Scripture sections. The notes include general summaries of chapters of larger passages as well as verse-specific commentary. Occasionally, the footnotes will include helpful charts such as “The Trinity in Romans 8” on page 2171, which highlights verses in Romans 8 that mention each member of the Godhead, or related maps such as the one near 2 Kings 15 that points out the ministry locations of the prophets of Israel and Judah. To see samples, click on these books of the Bible: Esther, Psalms, Isaiah, Ezekiel, Luke, Ephesians, Colossians, Revelation, or the whole book of Jonah or 1 John. Finally, I have found the notes especially helpful when I’m praying through the Psalms. As a pastor, I’m thrilled to see the wealth of articles the ESV-SB offers on theology and its application to everyday life. If the folks in my church have this Bible in hand or at home, I can point them to articles that help them find answers to their questions or further annotate a point I’ve made in a sermon or lesson. I can envision the ESV-SB and its articles being used as the textbook for lay ministry training class and equipping elders, deacons, teachers, small group leaders and other church leaders. I was particularly pleased with the article explaining “God’s Plan of Salvation” because it first described the big picture of salvation by rehearsing the theatrical drama of Creation, Rebellion, Redemption, and Consummation, and then filled in the theological details by “addressing the questions of God, man, Christ, the response, and the result” (page 2501). This approach helps bring together two approaches to the Bible: those who emphasize the Bible as story and those who focus on its systematic theology. These are good to help the reader get a grip on the gobs of information that is sometimes packed into a passage such as: “The Generations of Genesis,” “Chronology of Noah’s Time in the Ark,” “Five Major Offerings,” “Grades of Uncleanness,” “Positions and Duties of the Levites,” “The Parables of Jesus,” “The Humiliation and Exaltation of Christ,” “NT Guidelines for Giving,” “Harmony of the Events of Holy Week,” and so many more. Then there are some great “big picture” charts, including “The ‘Bookends’ of Biblical Theology,” “The Hebrew Calendar Compared to the Modern Calendar,” “The Already and Not Yet of the Last Days,” and others. Over 200 full-color maps—created with the latest digital technology, satellite images, and archaeological research; printed in full color throughout the Bible, plus 40 all-new illustrations—including full-color renderings and architectural diagrams of the Tabernacle, the Ark of the Covenant, Solomon’s temple, Herod’s temple, the city of Jerusalem in Jesus’ time and throughout the history of Israel, and many more. The artwork throughout the ESV-SB is beautiful. Nicely done. These are particularly handy in the online version, toward which I happily turn our attention. All of the Bible references (including cross references and those in the notes) are linked. That means you get two features: first, when you hover your cursor over the reference, the verse shows up in a “pop up” window, and then if you want to go to that passage in its context, you can get there with one click. All of the study notes, which in the print version are found at the bottom of the page, are on the right side of the Bible text in their own column. So, if you want notes on a particular verse, you only have to glance to the right instead of hunting for the corresponding note at the bottom of the page. With the click of your mouse you can listen to the audio of the passage you are studying. This may come in handy for folks who have trouble reading or even for English as a Second Language students learning to read. Another noteworthy feature is the “My Notes” column on the left side of the Bible text. You can type in your own commentary and save it for later. You may also enjoy the highlighter feature when allows you to select any amount of text and highlight it with one of five bright colors. All of the articles, maps, and charts are readily available for viewing and also have the Scripture references “hot linked” for quick study. It gives my-big-fat-study-Bible portability. I’m going to leave my hard copy at home for the family to use during family worship and Bible study with the kids. I’ll use the online edition everywhere else. Once again, the folks at Crossway have made it easy for you to sample these features at their website: “Click here for an overview with screenshots; or feel free to go directly to the Gospel of Matthew and explore for yourself.” And if you have more questions, you can read the Frequently Asked Questions About the Online Version at their blog. With solid study notes, attractive maps and drawings, informative charts, impressive articles, and the addition of the interactive online version, I’d say there is plenty of room on the shelf for the ESV Study Bible. Within days of its release on October 15 Crossway reported that it had sold all 100,000 copies of its initial printing and was ordering a second and third printing of 50,000 each. I’m sure the ESV Study Bible will become a long-loved resource for professors, pastors, and parishioners alike. Jimmy Davis is the associate editor of Worldview Church and pastor of Riverside Church in Knoxville, Tenn. He also maintains The Cruciform Life Blog. What Was a Source of Dietrich Bonhoeffer’s Moral Courage? What is more, Bonhoeffer’s dedication to daily prayer and meditation on the Scriptures was his sustaining force during the crises he had to face, culmintating in his martyrdom (XV). It isn’t rocket science, yet are we disicplined enough to daily pray and meditate on God’s Word? Bonhoeffer’s Spirituality Would Often Ruffle the Feathers of Others! Dietrich Bonhoeffer, a Protestant pastor, was one of Germany’s leading scholars of the twentieth century. He courageously returned from Union Seminary in New York to oppose Adolf Hitler. His great desire was for Christians to follow Christ whatever the cost. It was a cost he knew only too well: he was arrested, imprisoned, and executed (just days before the end of the Second World War) for his opposition to the Nazi regime. In his most famous work, The Cost of Discipleship (1937), he urged Christians to throw off everything that hindered their wholehearted allegiance to Christ, including the accumulation of wealth. Of course, manna is not the only pertinent biblical analogy. Proverbs 6:6-8 counsels the sluggard to imitate the ant, which “stores its provisions in summer.” And Genesis 41:46-57 presents Joseph as the model of prudence in storing grain for the lean years. Here Bonhoeffer goes on to draw the line between legitimate and illegitimate accumulation. Our treasure may of course be small and inconspicuous, but its size is immaterial; it all depends on the heart, on ourselves. And if we ask how we are to know where our hearts are, the answer is just as simple—everything which hinders us from loving God above all things and acts as a barrier between ourselves and our obedience to Jesus is our treasure, and the place where our heart is . . .
1 Dietrich Bonhoeffer, The Cost of Discipleship (London: SCM Press Ltd., 1959), 155-156. 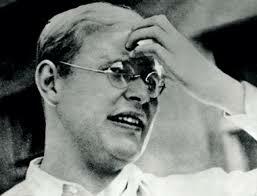 It is Worth It Looking Into Dietrich Bonhoeffer’s Spirituality. Bonhoeffer’s life and faith were animated by his love for Jesus Christ, his discovery of the self-sacrificing demands of the Sermon on the Mount, and his determination that, for Christians, geniune faith needs to be lived in Christian communities whose life together derives from the gospel mandates (XV). Of course, our highest model is Jesus himself. Yet, it doesn’t hurt to see how others have done just that.